Downing St. 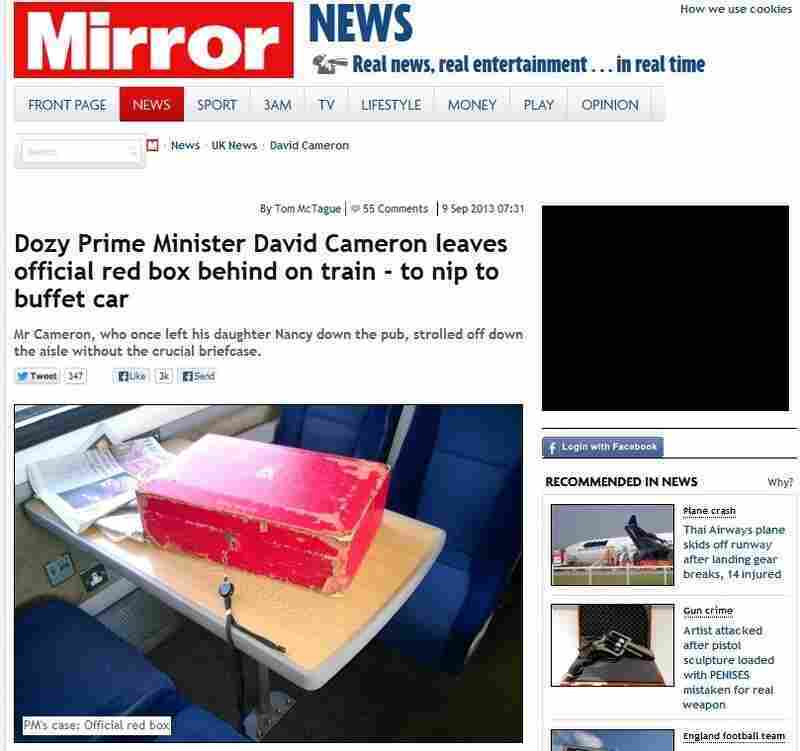 Denies 'Dozy' David Cameron Left Secrets Unguarded : The Two-Way The prime minister took a train from London to York on Saturday, and a passenger says Cameron left his "red box" unattended for a time. It's one of the traditional briefcases that British officials use to carry papers. Cameron's office, though, says security personnel were always near. The prime minister's "red box," looking rather lonely, on a train Saturday from London to York. The Mirror made it front page news. Since he's already got a reputation for absent-mindedness because last year he left his 8-year-old daughter behind at a pub, it's easy to see why Britain's Mirror is jumping on a claim that a "dozy" British Prime Minister David Cameron left the "red box" in which he carries official papers unguarded for a while Saturday while on a train from London to York. The Mirror's account, though, appears to be based on the claim of just "one astonished passenger ... [who] told how he stopped to take a picture of the red case and said nobody intervened." Cameron was supposedly off to get a bite to eat in the buffet car. But given that it's just one person's claim, there's reason to be skeptical of the sourcing. The story has also prompted some strong "push back" from the prime minister's office, No. 10 Downing St., which according to The Guardian says that, "the box was not left unattended and that the security detail protecting the prime minister was there at all times." Still, it's safe to say that No. 10 is a bit red-faced about the red box. Every British Cabinet minister has one of the cases, sometimes known as dispatch boxes or red boxes. Since their introduction in the early 1800s, the briefcases have been made by Barrow and Gale, a leather goods maker founded in 1750. Mohammed Suleman, a co-director of the firm, says the tradition has its roots in the secure boxes that once held papers meant for Britain's monarch. "Later, it was Prince Albert, Queen Victoria's husband and consort, that formally introduced the use of dispatch boxes by cabinet ministers," Suleman told NPR's Linda Wertheimer. "Handmade from pine, which has been grown in a cold climate to ensures greater durability, the boxes are covered with red-stained rams' leather. On the odd occasion, some have even been lead lined for extra protection, says ... Barrow and Gale."